At the turn of the last century women in the western world were finding a voice, both collectively and individually. 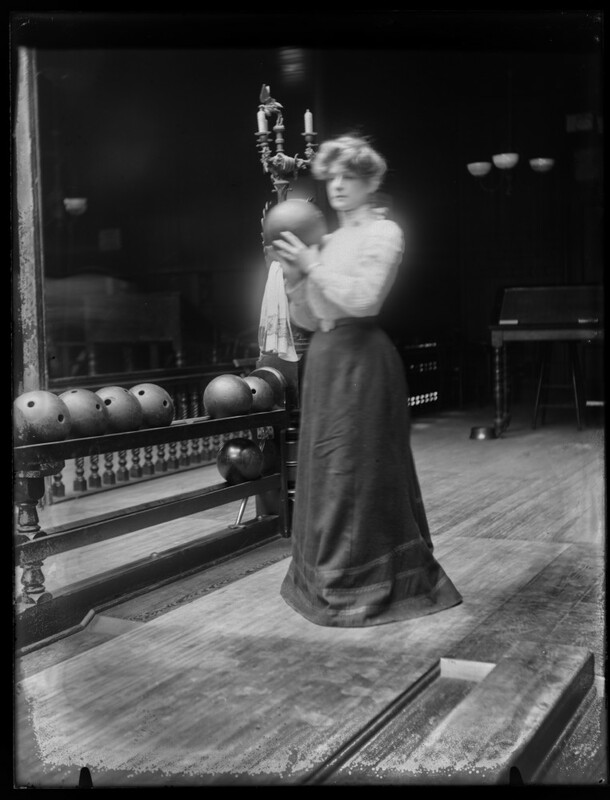 As the Victorian era lapsed in to memory and the Edwardian Era commenced many women chose to pursue sports. 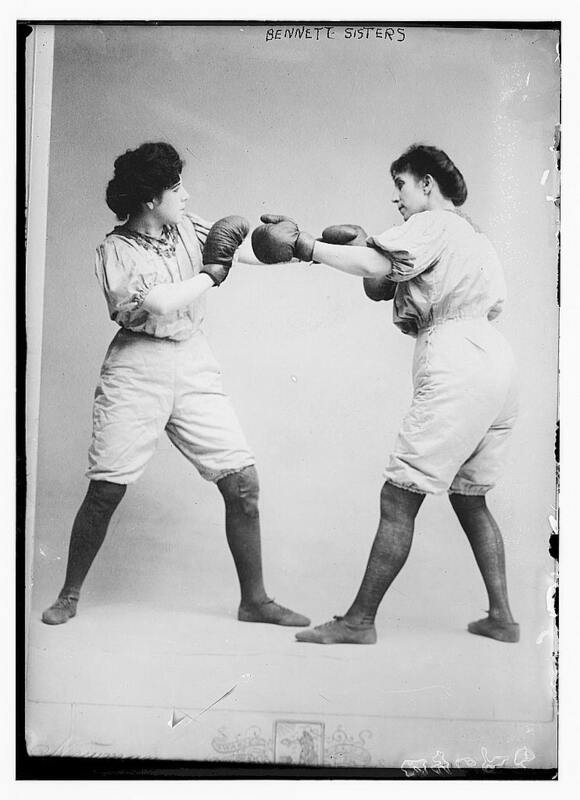 Some women chose to flaunt convention and compete in sports that, even today, are not thought of as traditional womens’ sports. 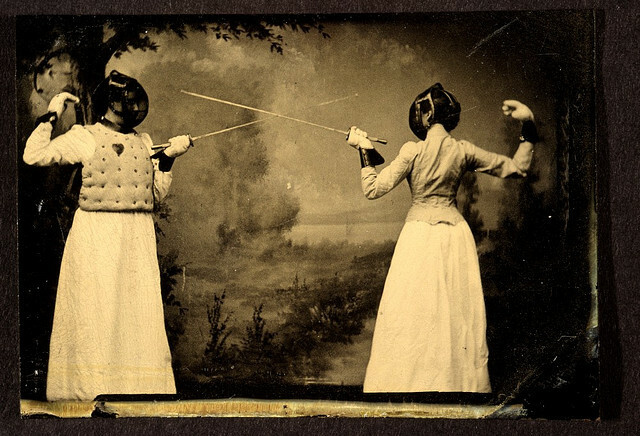 Some of these vintage pictures from the Edwardian Era (and just beyond) may surprise you. Yet these few representatives are surely testament to (under represented photograhically) a greater percentage of the women of the past who were unafraid to pursue their sporting ambitions in a still male dominated world. You may well have seen the movie starring Madonna and Geena Davis, A League of Their Own about the All-American Girls Professional Baseball League (AAGPBL) which was founded in 1943. 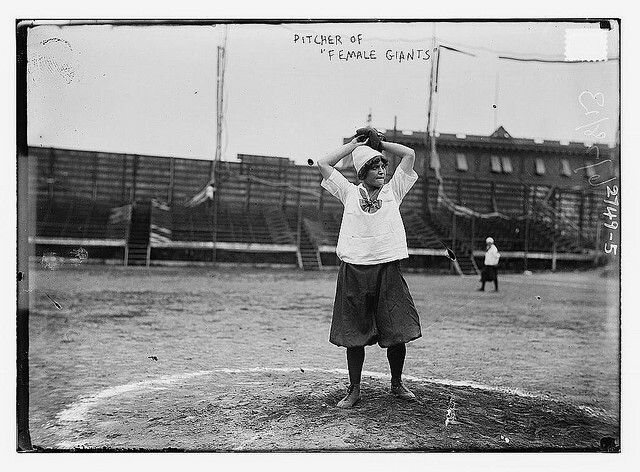 Back in 1913, however, there were the New York Female Giants. There was a red team and a blue team. 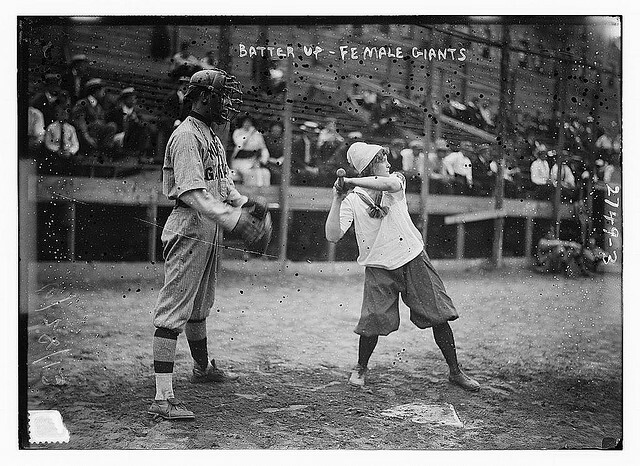 The idea did not take off permanently, unfortunately, yet the first girls of summer, women who were made their living playing baseball had competed in their first game as far back as 1875. Notice the male catcher definitely one of the NY (male) Giants catchers.This could possibly have been some sort of exhibition game as there were two female teams. You can only wonder how badly the men were beaten by the women. The Bennett Sisters – we are not talking Jane and Elizabeth, plus there is no sign of Mr Darcy anywhere. 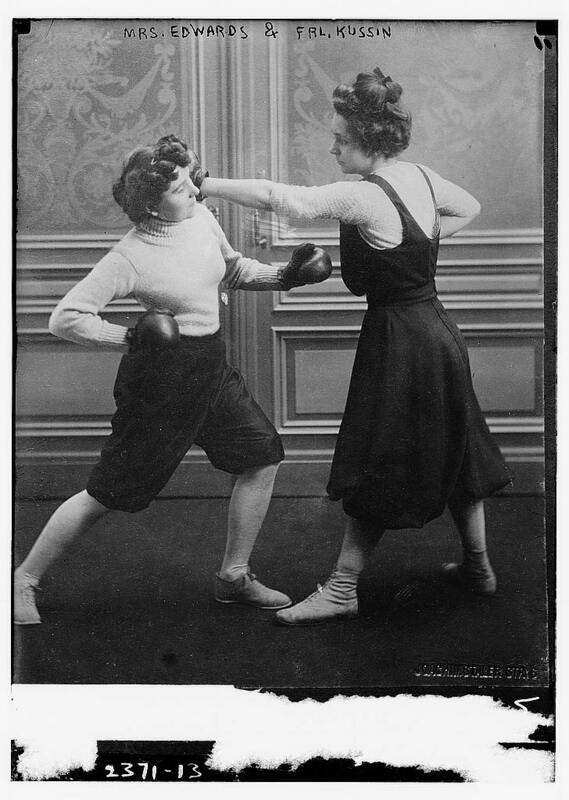 This picture was taken between 1910 and 1915 and the sisters were not professional boxers but a Vaudeville Act. Yet that was perhaps one of the few places at the time that you could see something like this. Yes, they wrestled too. 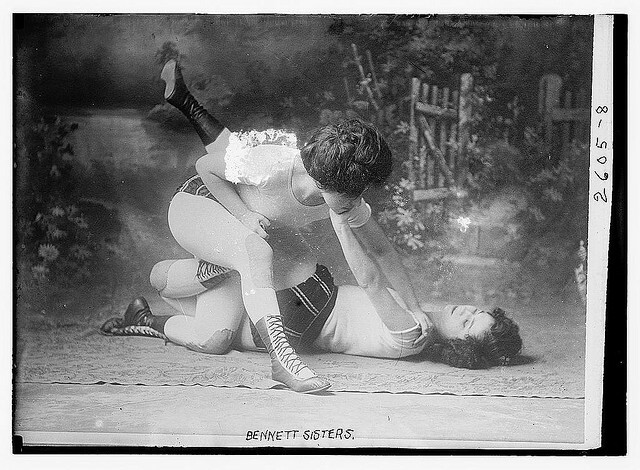 Althoug it seem surprising (perhaps) the US had, since late the nineteenth century, held women’s wrestling championships and championesses were proclaimed. 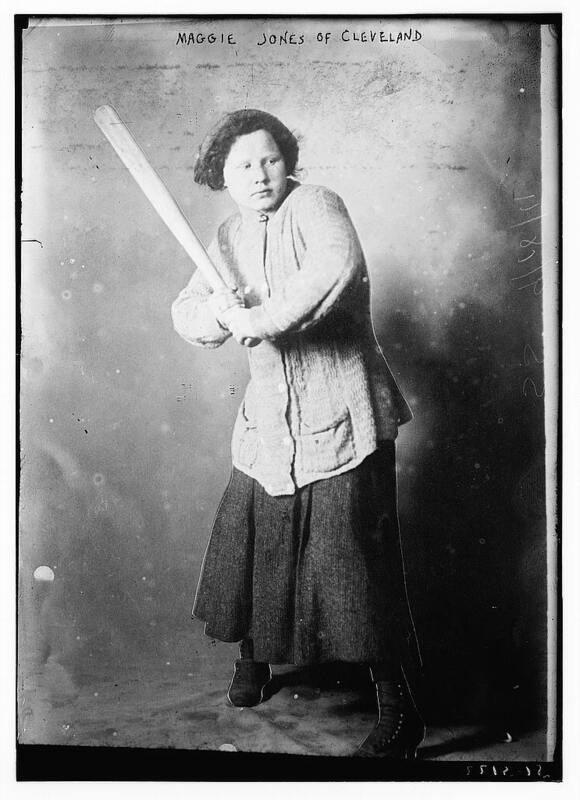 One of the above is possibly Laura Bennett who dominated the sport in the early 1900s. If you think that the Bennett Sisiters were alone, you would be wrong. 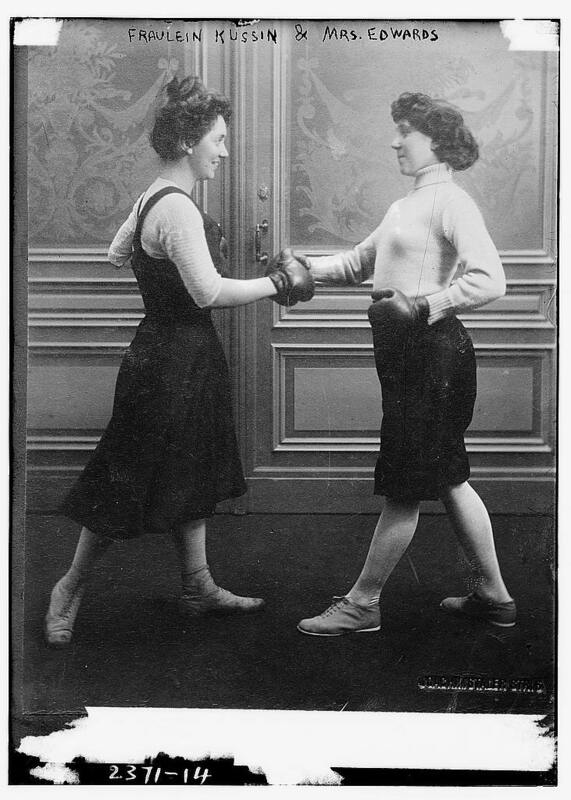 Above, Mrs. Edwards and Faurlein Kussin who met in the boxing ring at a bout on March 7 1912 – just a month before the Titanic sank. 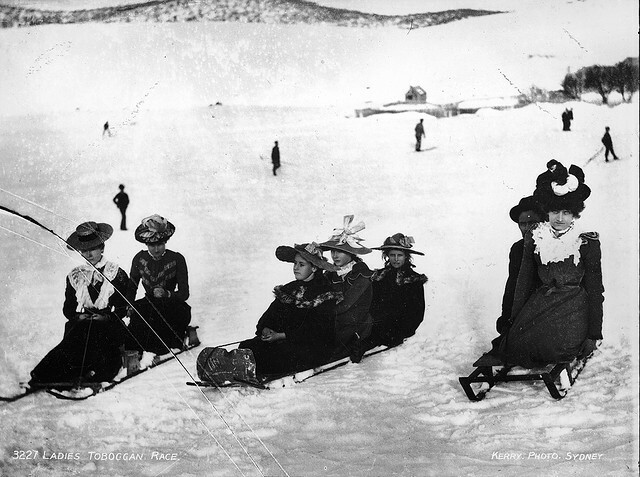 In fact,women were everywhere in things of a sporting nature. Can you guess in which sport the woman below participated? 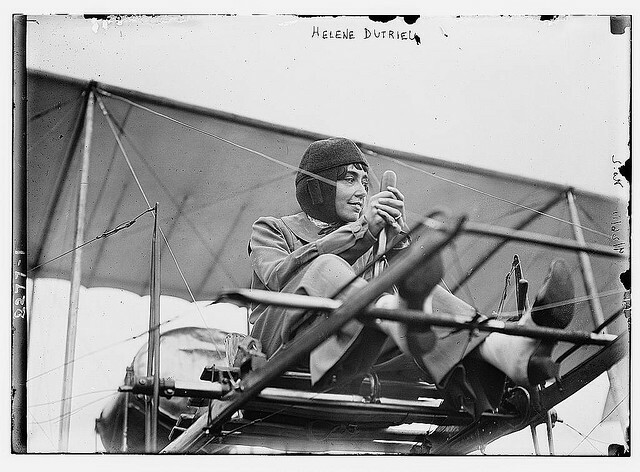 It was everything to do with the burgeoning science of flight and although not considered a sport, this woman was something else – and very much connected with sport and just about everything else. 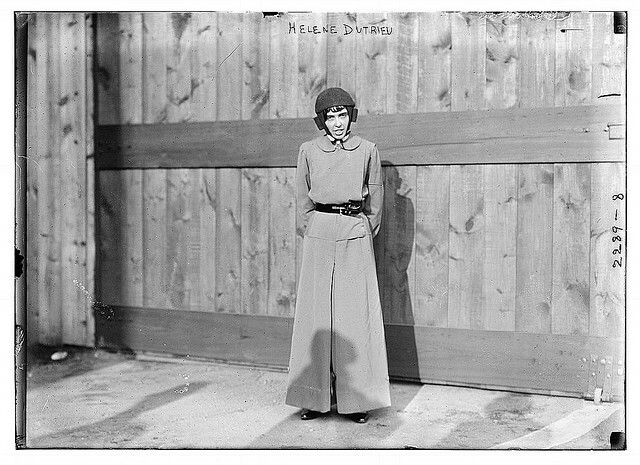 This is Hélène Dutrieu and the picture was taken in September 1911 when she was 34. Before this, however she had been a famous professional track cyclist and had created a new world record for the distance cycled by a woman in an hour in 1895. This picture was taken when she visited the US to compete for the women’s altitude record. Later, during the First World War she became an abulance driver and a director for a military hospital. As you have gathered, she wasn’t one to let her gender set her back. Dutrieu may have shocked people with her independant spirit but our next woman shocked people with her ankles. Although she was born in the UK her family moved to California when she was six. 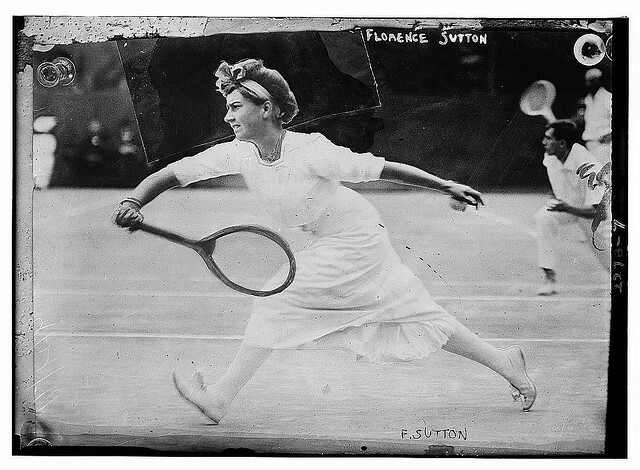 She and her three sisters, Violet, Florence (pictured below) and Ethel were the queens of the California tennis circuit and she took the US Championship when she was 18, in 1904. The four of them must have been the Venus and Serena and Venus and Serena of their day. What did she do that was so shocking? Prepare to gasp. 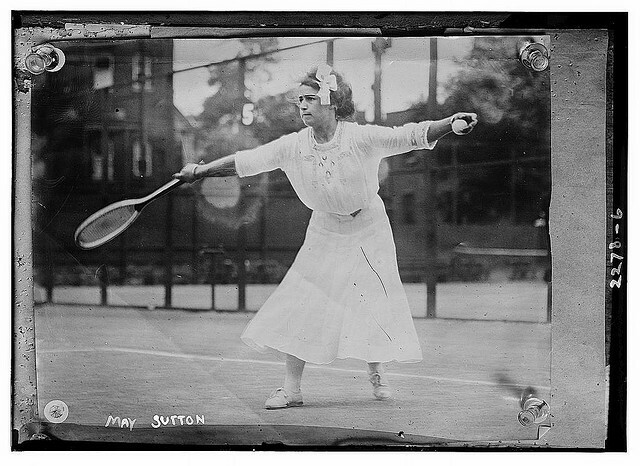 In 1905 she competed at Wimbledon (winning the Women’s title). Unable to compete in her normal tennis attire she rolled up her sleeves – and showed her bare elbows to the world. Not only that, she wore a skirt that was so high it revealed her ankles, shocking the British audience and giving them something to talk about over their tea and cucumber sandwiches. 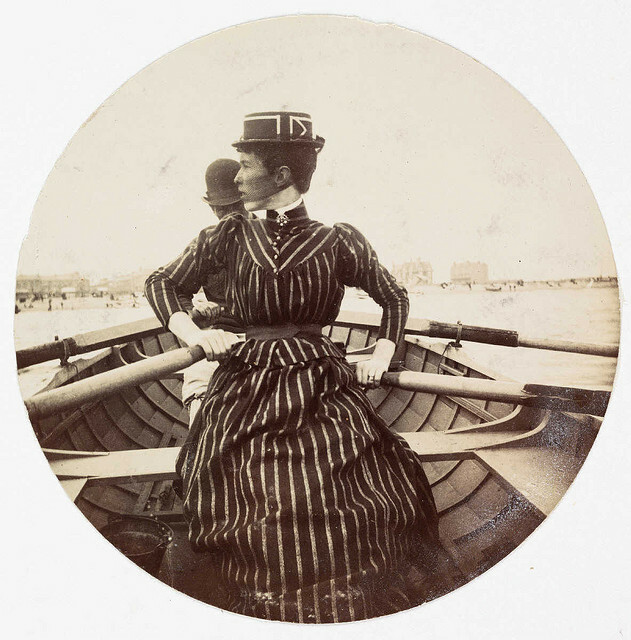 In fact, during the Edwardian era women were doing a remarkable amount of sport, some of which was caught on camera. They batted. It wouldn’t be cricket, really, without mentioning that noblest of games. The Edwardian Era, itself not as gleeful as many like to think, gave way to the darkness of the First World War. In a state of total war, many women joined up. Yet there was still time to be found to have some fun with a bat and ball. This was a long post so thanks for hanging around till the end. It has hardly hit the surface either and we hope – with your help – to explore the role of women in sport further. For now, we will take our leave with a final shot, taken around 1900 of Miss Elaine Golding. The daughter of Ethel Golding, the champion lady swimmer of the world. Elaine had been immersed in swimming since infancy and was dubbed a seven-year-old wonder, taking part in exhibitions of diving and swimming. Take it away, Elaine.